There was a lot of talk about de-coupling. But they weren’t referring to what people get up to in laybys. It was a Unilever inspired session on sustainable consumption, which I watched as a webcast. De-coupling in this case was all about ‘green growth’ – whether it’s possible for a company to both increase profits and improve sustainability. 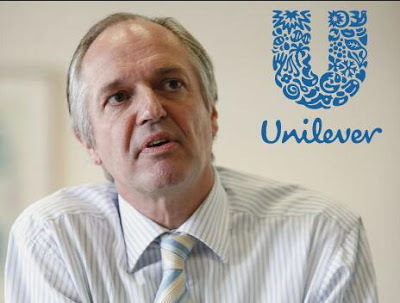 You won’t be surprised to learn that Paul Polman, CEO of Unilever thought it was. In fact, he wants to double the size of the company, whilst reducing its environmental impact. And he seemed pretty committed – referring to WWF’s calculation that we need three planets to go on consuming at current rates. As a father, he said, he didn’t want to steal resources from future generations. So Unilever have come up with a ‘Sustainable Living Plan’, with three goals: 1. To halve the environmental footprint of their products; 2. To source 100% of their agricultural ingredients sustainably by 2015 and 3. To help 1 billion people out of poverty. The last goal reflects their commitment to the social dimension of sustainability. With 2 billion Unilever products sold every day, what the company does can make a big difference. And one of the important points they made was that they were looking at reducing their environmental impact from cradle to grave – and that included how consumers actually use the products they make. For example, by reducing wash temperatures for laundry detergents with their Persil Small & Mighty brand, although this is also being done by their main rival Procter & Gamble, with Ariel Excel Gel. Another, less well known, example is with Unilever’s Comfort One Rinse fabric conditioner, sold in developing countries. Only one bucket of water is needed to fully rinse the clothes, rather than three. If everyone used it, over 500 billion litres of water would be saved in a year. After presentations from Unilever there was a panel discussion and Q&A session. Both John Elkington, co-founder of SustainAbility with me, and Jonathon Porritt, were on the panel. Dr. Mike Warhurst (Report on Overconsumption) from Friends of the Earth was really spot on with his question. He pointed out that with more people, more consumption, more meat eating and a requirement for less fossil fuels, demand for land is going to explode. ‘Had Unilever measured it’s land footprint’, he asked, and ‘how might this increase with some of the changes they proposed?’ One solution offered was that the company would try to improve yields without using fossil fuel fertilisers. It was also explained that ingredients such as beef, soya and palm oil won’t be sourced from forest areas. Unilever have teamed up with Greenpeace to call for a moratorium on all deforestation in some parts of the world. Other questions were asked about companies becoming campaigners, about selling sustainability to the City and about how far Unilever will go in forcing suppliers and employees to change. But the one that flummoxed the respondents was a question asking whether the company would be able to commit to all their products being sustainable in 10 years time. It seemed that dropping unsustainable products or ‘choice editing’ was a step too far. This entry was posted in BLOG, Business, Detergents & Cleaning, Home & Household, News 2010. Bookmark the permalink. Unilever (big business) and sustainability! The most obvious example of an oxymoron I've ever come across. And as laughable as the coalition's plan to bring in businesses leader to help them tackle food and health issues. So we will witness the obscene sight of Pepsi and McDonalds advising the Government on obesity issues. Sorry, capitalism is not and never will be sustainable, its ethos is growth, which as you know Julia depends on using the earth's resources to continue to expand.